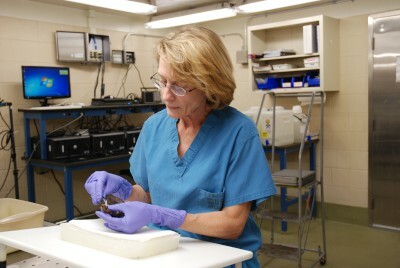 Dr. Carol U. Meteyer examining a bat. Photo Credit: Nathan Ramsay, USGS. 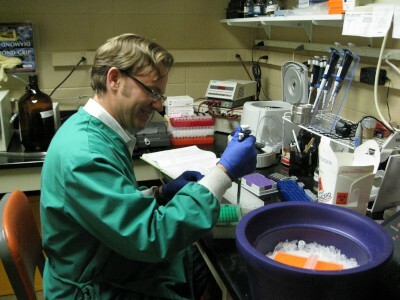 Dr. David S. Blehert working in a laboratory. Photo Credit: Cathy Acker, USGS. Dr. Carol U. Meteyer and Dr. David S. Blehert received the Tom Thorne and Beth Williams Memorial Award from the Wildlife Disease Association and the American Association of Wildlife Veterinarians for their pioneering work on white-nose syndrome (WNS) in bats. WNS, a disease caused by the fungus Pseudogymnoascus destructans, has killed millions of bats in North America since it was first diagnosed in New York in 2007. Pseudogymnoascus destructans shows up as a white fungus that infects skin of the muzzle, ears, and wings of hibernating bats—hence the name white-nose syndrome. Although WNS does not pose a direct threat to people, the disease decimates bats, which serve critical ecological functions by consuming insect pests of crops and forests. Without bats it is estimated that agricultural losses in North America alone would exceed $3 billion each year. The Tom Thorne and Beth Williams Memorial Award is presented by the Wildlife Disease Association and American Association of Wildlife Veterinarians to scientists "in acknowledgement of either an exemplary contribution or achievement combining wildlife disease research with wildlife management policy implementation or elucidating particularly significant problems in wildlife health." Dr. Meteyer and Dr. Blehert received the award for their seminal scientific research, publications, and expert consultation that have been instrumental in the wildlife health community's understanding of WNS. Their research confirmed the cause of WNS, defined the pathologic criteria for diagnosing WNS, provided new information on the biology of Pseudogymnoascus destructans, and provided a nonlethal ultraviolet (UV) light screening tool for WNS. Dr. Blehert's and Dr. Meteyer's scientific discoveries and publications have laid the groundwork for all subsequent and future studies on WNS. Dr. Meteyer has investigated the causes of wildlife mortality in more than 6,000 animals and provided initial detections and pathophysiology of several wildlife diseases in the United States and overseas, including identification of the veterinary drug, diclofenac, as the cause of the population crash of Gyps vultures in Pakistan. She has also championed efforts to address effects of endocrine disrupting chemicals on fish and wildlife of the Chesapeake Bay. Dr. Blehert manages the Wildlife Disease Diagnostic Laboratories Branch at the U.S. Geological Survey (USGS) National Wildlife Health Center (NWHC). As Branch Chief, he oversees investigations to determine cause of death for wildlife mortality events across the U.S. and to detect, discover and characterize emerging pathogens. His laboratories also conduct surveillance for animal diseases of high consequence. Through this work, Dr. Blehert and the NWHC support efforts to mitigate the impacts of infectious disease to wildlife, domestic animals, and humans. Blehert, D.S., Hicks, A.C., Behr, M., Meteyer, C.U., Berlowski-Zier, B.M., Buckles, E.L., Coleman, J.T.H., Darling, S.R., Gargas, A., Niver, R., Okoniewski, J.C., Rudd, R.J., and Stone, W.B., 2009, Bat white-nose syndrome—An emerging fungal pathogen? : Science, v. 323, no. 5911, p. 227, doi:10.1126/science.1163874. Cryan, P.M., Meteyer, C.U., Boyles, J.G., and Blehert, D.S., 2010, Wing pathology of white-nose syndrome in bats suggests life-threatening disruption of physiology: BMC Biology, v. 8, no. 135, pp. 8, doi:10.1186/1741-7007-8-135. Gargas, A., Trest, M.T., Christensen, M., Volk, T.J., and Blehert, D.S., 2009, Geomyces destructans sp. nov. associated with bat white-nose syndrome: Mycotaxon, v. 108, p. 147–154. Lorch, J.M., Meteyer, C.U., Behr, M.J., Boyles, J.G., Cryan, P.M., Hicks, A.C., Ballmann, A.E., Coleman, J.T.H., Redell, D.N., Reeder, D.M., and Blehert, D.S., 2011, Experimental infection of bats with Geomyces destructans causes white-nose syndrome: Nature, v. 480, no. 7377, p. 376–378, doi:10.1038/nature10590. Meteyer, C.U., Barber, D., and Mandl, J.N., 2012, Pathology in euthermic bats with white nose syndrome suggests a natural manifestation of immune reconstitution inflammatory syndrome: Virulence, v. 3, no. 7, p. 583–588, doi:10.4161/viru.22330. Meteyer, C.U., Buckles, E.L., Blehert, D.S., Hicks, A.C., Green, D.E., Shearn-Bochsler, V., Thomas, N.J., Gargas, A., and Behr, M.J., 2009, Histopathologic criteria to confirm white-nose syndrome in bats: Journal of Veterinary Diagnostic Investigation, v. 21, no. 4, p. 411–414, doi:10.1177/104063870902100401. Turner, G.G., Meteyer, C.U., Barton, H., Gumbs, J.F., Reeder, D.M., Overton, B., Bandouchova, H., Bartonička, T., Martínková, N., Pikula, J., Zukal, J., and Blehert, D.S., 2014, Nonlethal screening of bat-wing skin with the use of ultraviolet fluorescence to detect lesions indicative of white-nose syndrome: Journal of Wildlife Diseases, v. 50, no. 3, p. 566–573, doi:10.7589/2014-03-058. Verant, M.L., Meteyer, C.U., Speakman, J.R., Cryan, P.M., Lorch, J.M., and Blehert, D.S., 2014, White-nose syndrome initiates a cascade of physiologic disturbances in the hibernating bat host: BMC Physiology, v. 14, no. 1, p. 10, doi:10.1186/s12899-014-0010-4. Warnecke, L., Turner, J.M., Bollinger, T.K., Lorch, J.M., Misra, V., Cryan, P.M., Wibbelt, G., Blehert, D.S., and Willis, C.K.R., 2012, Inoculation of bats with European Geomyces destructans supports the novel pathogen hypothesis for the origin of white-nose syndrome: Proceedings of the National Academy of Sciences of the United States of America, v. 109, no. 18, p. 6999–7003, doi:10.1073/pnas.1200374109.